You'll feel many miles away from civilization as this rustic 450-acre site in rural Upper Freehold is located amidst the rolling farmland of western Monmouth County. One of the most beautiful parks in the county park system, the property is known for stately stands of red and white oak, beech, ash and birch trees. 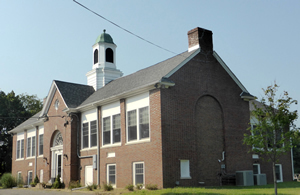 In late 2015, the Park System acquired the Imlaystown School on Davis Station Road. Once home to the offices of the Drug Abuse Resistance Education New Jersey, the building is now called the Clayton Park Activity Center and allows the Park System to offer a variety of programs in the park. The forested, hilly trails of this park have become a popular destination for hikers, equestrians, and bicyclists. Enter from Emley's Hill Road (6 miles of trails). Click here to open map as a PDF. Click here to open as larger image. Interstate 195 to exit 11 (Imlaystown/Cox's Corner). Eastbound, turn right and follow to end; westbound, turn left and follow to end. Turn left onto Rt. 526 and make immediate right onto Imlaystown-Davis Station Rd. Follow to Emley's Hill Rd., turn left. Follow to Park on left. Rt. 537 west to Rt. 526 (becomes Red Valley Rd.) to Imlaystown-Davis Station Rd. Turn left and follow Imlaystown-Davis Station Rd. to Emley's Hill Rd., turn left and follow to Park on left. 1-195 W to Exit 11 turning south toward Imlaystown. Keep left at the fork, follow signs for Imlaystown. 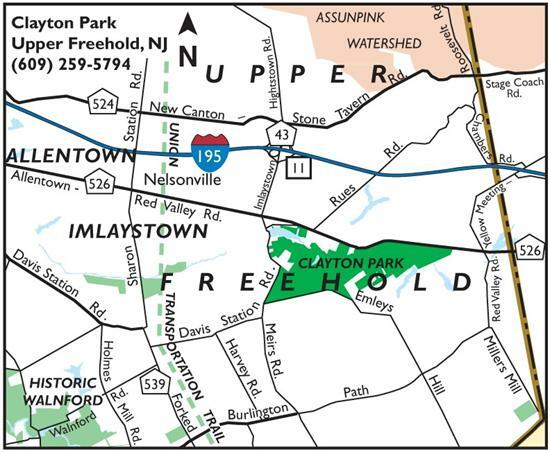 In 300 feet, turn left onto Imlaystown-Hightstown Road. In .8 mile turn left onto Allentown-Lakewood Road. In 150 ft., turn right onto Imlaystown Road. In .1 mile, slight right onto Davis Station Road. Activity Center is in .2 mile on the right.